Health/life Agents - Medicare Agents Wanted!!! Health/life Agents – Medicare Agents Wanted!!! Looking for a new career or add to your portfolio? Are you content with the money you’re earning today? Would you like to be your own boss and have no limit on your earning power? Are you getting the training and support you need in order to be successful? We want YOU to join our team of successful Medicare Supplement Agents! We are a local family owned agency in South Florida specializing in Medicare Supplement Insurance. We have 30 years of experience in the insurance business and we are proud to have become the area’s premier provider for Medicare Supplement insurance plans. Nationally recognized by United American Insurance for 12 consecutive years as one of the top production agencies in the nation, we are members of the elite United American Eagle Club of outstanding insurance agencies. Our agents have no-limit on income potential by earning life-time level monthly residual income for the life of each policy! We are looking for new agents like you to come on board! We’ll provide the tools to make your job easier and become a nationwide successful producer! Searching for highly self-motivated and sales driven Insurance Agents!!! Here’s your chance to work for one of the top production agencies in the country for Medicare Supplement Insurance. 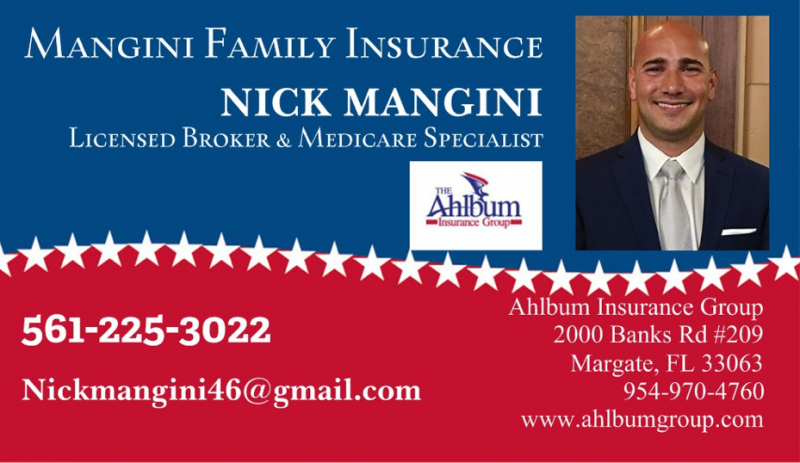 CONTACT NICK MANGINI TODAY AND BEGIN YOUR NEW INSURANCE CAREER!! !